When I wrote yesterday’s post about my concrete kitchen countertops, what they look like now, and what I plan to do about it, I pretty much knew the direction I was headed. I had my plan in place. And then I started down the research path again, and found some very interesting and exciting information about two different countertop coating options — polyurea and epoxy. I wanted to share because I’m pretty sure that both of these options can be used to update a variety of existing countertops (i.e., it’s not just for concrete), and both are very reasonably priced, especially compared to the price of completely replacing countertops. So those of you looking to update on a budget might find this info helpful also. Anyway, I’ve had about three people over the last week or two suggest that I look into epoxy for my countertops. I looked at a few pictures, and then for some reason, I moved on. I had already decided to use the Stonelok sealer that I mentioned in yesterday’s post (which, by the way, is an epoxy/urethane sealer that can be sprayed or rolled on). But yesterday as I was working on my countertops, I was having a heck of a time getting things to work right. 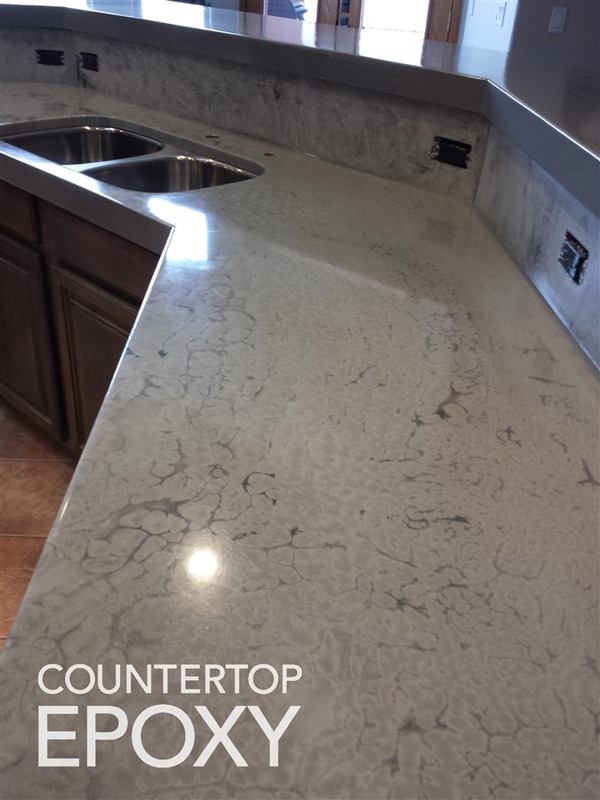 I contacted the concrete countertop company to see what to use to remove the sealer. They said to use acetone, which made my kitchen smell like a nail salon, but seemed to have little effect on my countertop. So I headed to Home Depot to see what they had. I grabbed these two products. The first one is a stripper, and the label says it’ll strip sealers. The second is a cleaner and etcher. Etching is necessary to make the surface porous so that it can be stained or really grab onto any surface coatings. The stripper just made my countertops incredibly sticky, but it never really got all of the sealer off. Even after the countertops were dry, they were very sticky. So I headed back to Home Depot to buy another product. This time I got some kind of acid that says it’s safer than muriatic acid, and it comes in a dry form that sounds like little tiny pebbles in the jar. You mix it with water and let it sit on the surface of the concrete, and voila! Etched concrete. Or so they say. But I got home and felt completely unmotivated to try one more thing that probably wouldn’t work, so I sat down at my computer and remembered the epoxy suggestions. So I started looking. And this time I really looked. 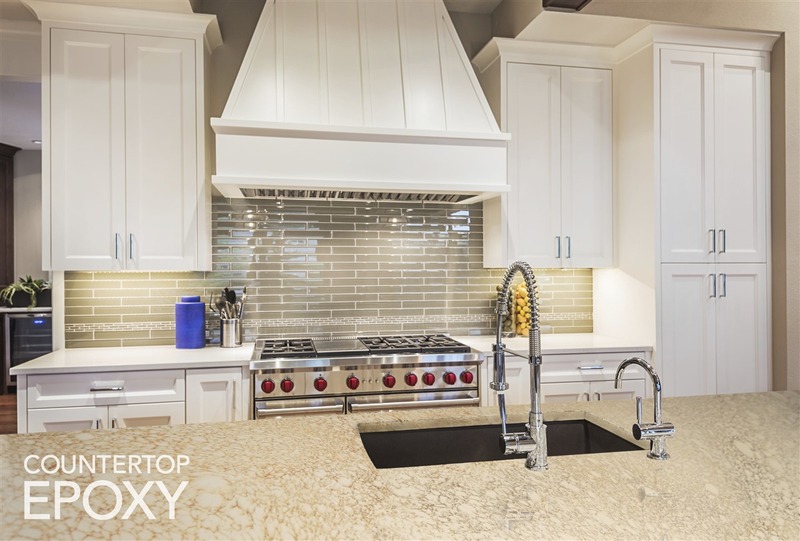 Let me tell you, there are some amazing epoxy countertop ideas out there! 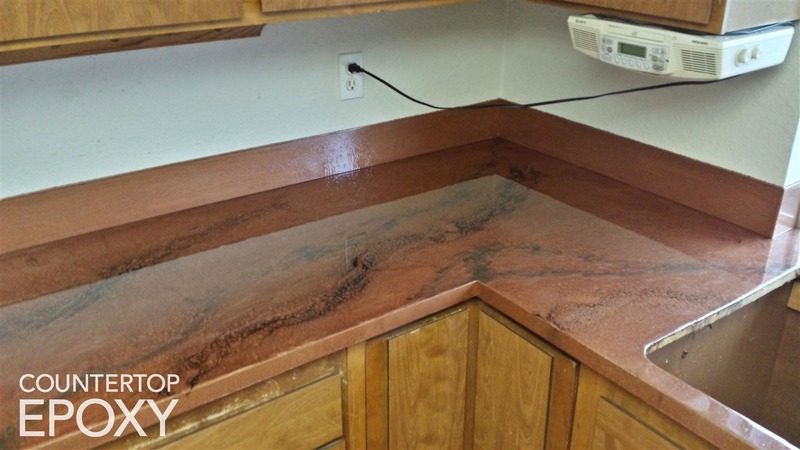 Here are a few from this site called Countertop Epoxy, and while these aren’t what I’m looking for, you can see how beautiful this can be. Aren’t those pretty? Again, none of those are what I’m looking for, but there’s definite potential there. Epoxy sealers form a high-build protective film on the concrete surface, producing a hard, long-wearing, abrasion-resistant finish. They also offer excellent water repellence. They are available clear or pigmented, if you wish to add color. Most products impart a glossy finish. Epoxy sealers are much harder than acrylics. Water-based epoxies bond well to concrete and provide a clear finish, but they are nonporous and do not allow trapped moisture to escape. 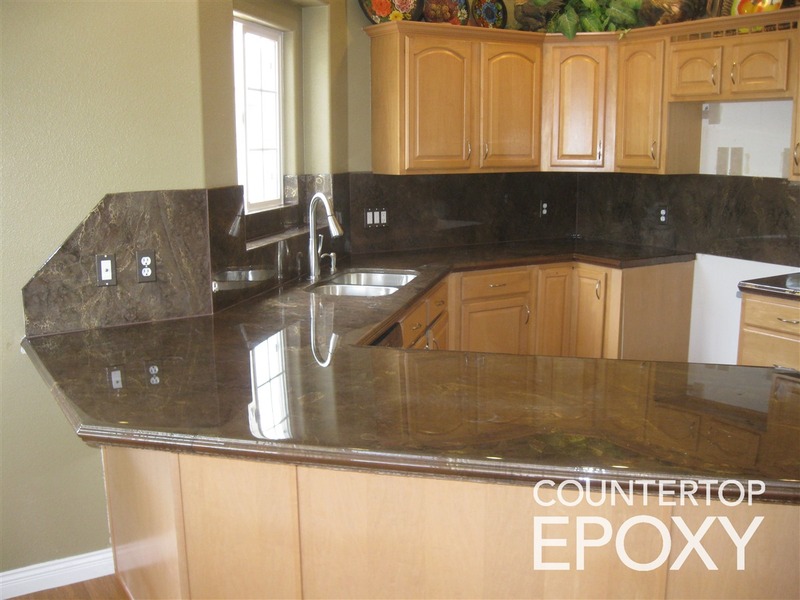 Epoxies are probably the best choice for concrete countertops and food-preparation areas. That sounds pretty good, right? I do love that there’s such a wide range of options with epoxies. You can add color directly to the epoxy, or you can paint/stain the surface first, and then add clear epoxy over the top. 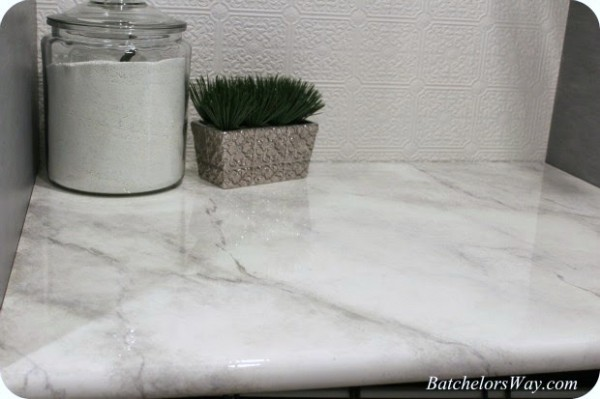 As I’ve mentioned, I’d love my countertops to look like marble, and I found a few examples of surfaces that were painted to look like marble or granite and then coated with clear epoxy. And you can read how well those countertops held up after two years of use here. Those are beautiful, right? And while my main opposition to epoxy countertops has been the super high gloss finish, I have to admit that it’s growing on me a bit. Now can you set pots and pans directly from your stovetop onto epoxy countertops? Nope. But you shouldn’t do that on granite or any other natural stone, either. Can you chop veggies directly on it? You probably shouldn’t, but I never do that anyway. Putting food directly on my countertop kind of makes me cringe, so I always use cutting boards even with my indestructible concrete. So as I was reading and looking at pictures last night, epoxy started looking like a really great option to me. And while epoxy counteretops are very easily DIYable (and I’ve wanted to try it for the longest time…it just looks fun), I got to wondering if maybe there was a company in my area that would do it for me so that I could be sure to get a very durable, professional finish. My online search for epoxy countertops in Waco only led me to one local company called Garage Force. And as I looked through their portfolio on their Facebook page, I noticed I only saw floors. They do mostly garage floors (hence, the name), but they also do interior floors, patios, outdoor walkways, etc. Their products can be used on concrete, tile…basically anything. Their portfolio is impressive, but…no countertops. But as I read through the comments, I saw where the owner said that they hadn’t done a countertop yet, but they certainly could! Are y’all familiar with polyurea? It’s unbelievably amazing stuff! 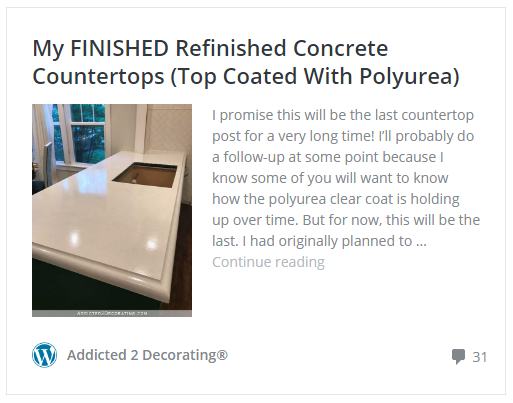 I was first introduced to polyurea several months ago (maybe a year now) when I first began my research into solutions for my concrete countertops. I found that, hands down, polyurea is the best protective coating that exists. Urethanes and epoxies can’t hold a candle to the strength and durability of polyurea. In fact, polyurea is 20 times stronger than epoxy, it dries to the touch very quickly and when used on garage floors, can be driven on in 24 hours, it has no VOC’s, and very little odor. I remember being absolutely amazed watching videos like this, where a cardboard box is sprayed with polyurea, filled with water, then the top of the water is sprayed with polyurea, and then the guy stands on it!! I ruled it out all those months ago, because I couldn’t find any polyurea products that I thought I could DIY, and I certainly didn’t know there would be a place right here in Waco, Texas that had that amazing product. But there is! 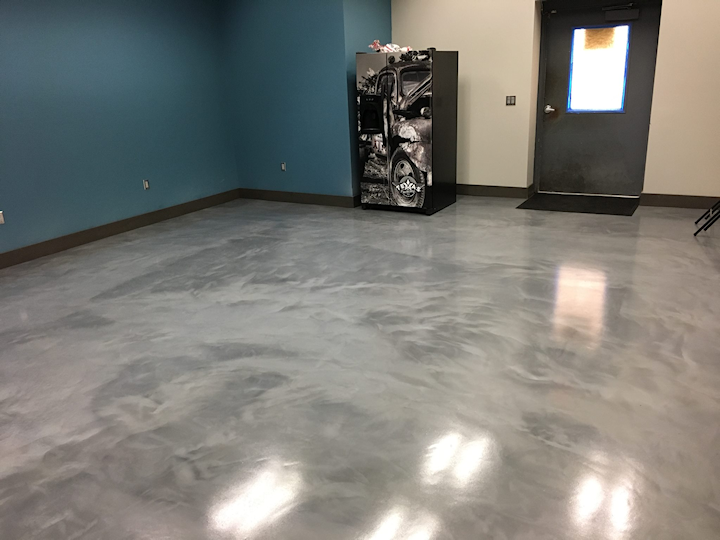 And not only can they mix their product in just about any color imaginable, but they also have a clear polyurea coating that can be used over painted/stained surfaces. So that means that I can get my countertop looking just like I want it (e.g., marble, granite or some other design), and then they can spray the clear polyurea right over the top to protect it. He said it works just fine over latex paints, it goes on crystal clear and never yellows. The best thing? The price! The colored products are anywhere from $5 to $8 per square foot, but the clear coat runs about $2 per square foot. And I only have 54 square feet of countertop space in my kitchen! Anyway, he’s coming later this week to look at my counteretops and be very sure that we can do exactly what I’m planning, so I’m just hoping and praying that this works out. 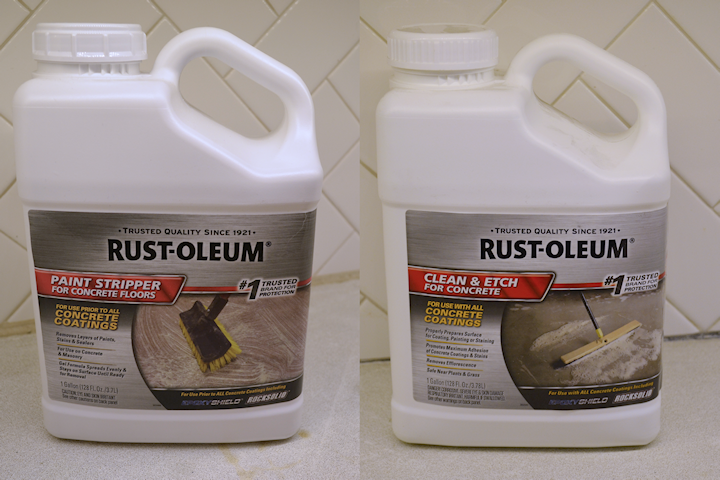 This would be the ideal coating for my countertops, and it’s so durable that it comes with a lifetime warranty. It sounds very promising! I hope it all works out just right for you. That sounds perfect! I can’t wait to see pictures. Could they just do the whole process for you? Making it look like marble so you don’t have to paint it yourself? Just curious if they can achieve that result, though I know you may be itching to try the painting yourself. Do you still have to etch/strip the counters now or can you forgo that hurdle? I don’t think I’d trust anyone else to do the marble look for me. 🙂 I’m not even sure if I can pull it off, but I do know that achieving a real marble look takes an artistic eye and lots of patience. I’d rather do that part myself, and then just let them add the protective coating. I really don’t think I’ll need to etch now. I’ll probably just need to be sure to use a really good masonry primer before I add my decorative painting. I’m still thinking through and trying to work out the process, though. I do still have those pits and divets that need to be filled and smoothed, but I don’t think that etching will be necessary for that. My artist friends uses a feather to get a real marble look. This is very exciting! Can’t wait to hear of your progress. Personally, I love the high gloss. It looks so clean! 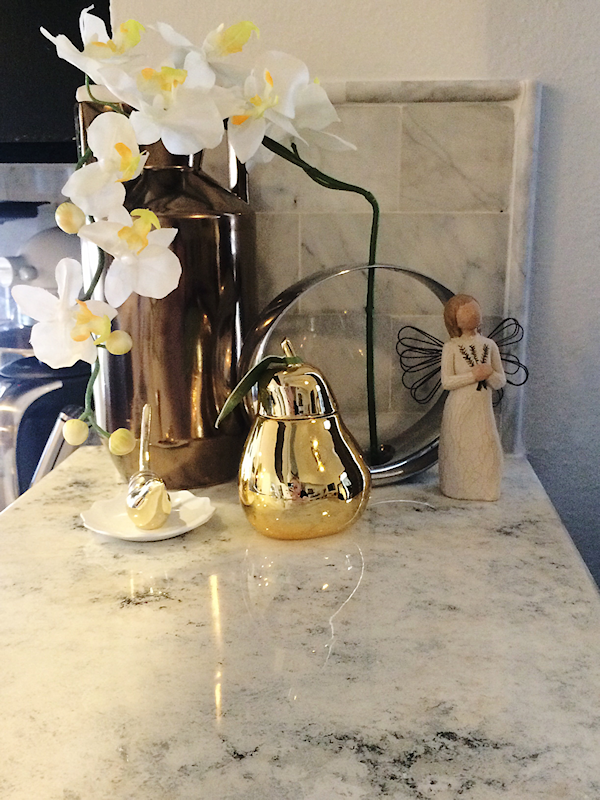 If you were to decide on your ultimate counter to (marble), isn’t it high gloss? Yesterday I wanted to comment that you’re not gonna be satisfied with anything until you break down & get marble, but if you can get the “marble-look” that these guys offer, it may just be the answer! Looking forward to this! Marble isn’t necessarily high gloss, they can do it in a honed finish too which is matt and gorgeous and less prone to etching (I so nearly put this in my kitchen, but… stains). Another great, informative post! Thanks for sharing your research and useful information! Food will be safe around the polyurea coating, then? Yes, he said it’s food safe once cured. 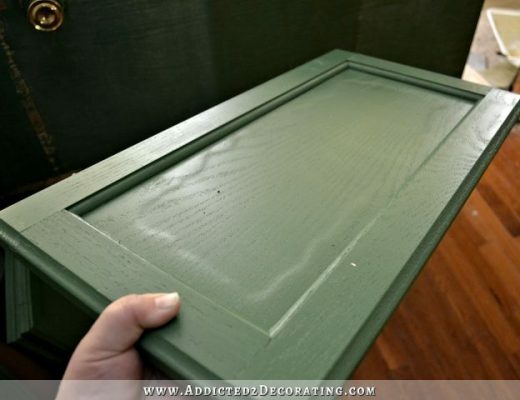 I know you mentioned that the coating could go on concrete and tile, but do you know if something like this would this work on your standard laminate counter tops? I’d love to update my very boring tan laminate counter tops without having to completely change them out. I know for sure you can paint and then epoxy laminate countertops. If you to to Pinterest and search, you’ll find many examples. And I would assume that the polyurea would also work. He said that it can be used over latex paint. The main thing is just that you have to be sure to properly and thoroughly prep the countertop before painting to be sure that the paint adheres well to the countertop. A word of caution to those less experienced than Kristi: When using flammable adhesives or solvents, turn off all pilot lights, if you have any. One of the stories I covered as a newspaper reporter years ago involved a couple using a flammable mastic on a countertop. The fumes were ignited by the pilot light on a nearby water heater. Nobody died, but the results were tragic just the same. About putting hot pots on countertops: With ceramic tile, you can do this without fear. (I do it almost daily.) Ironically, tile, although it’s much cheaper. is out of favor right now. Most people hate the grout, although the tiles can be placed very close together to minimize this. Too bad they can’t come up with a one-piece ceramic countertop. was excellent. Besides, retro is supposed to be coming back! It’s very popular to use ceramic tiles here. It looks like granite and actually homogeneous tiles. It is durable and affordable. The most popular one comes with 60 cm x 60 cm in size, which is great to minimize the grout. It says you should use their products and that it’s not for beginners. I used regular craft paint and I’ve never done faux marble paint in my life and it came out so believable! Can’t wait to see what you do and how everything looks when it’s done! Wow that’s beautiful! People are so creative. I am sorry, you make my head spin. I thought you were building a pantry and a breakfast room. 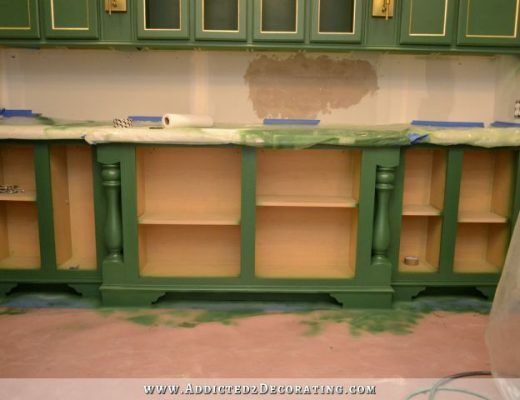 Now you are painting your kitchen cabinets and resurfacing your countertops. Who gets a redo on all their renovations The average follower does not. Kristi has explained this numerous times. I know how you feel Christine. 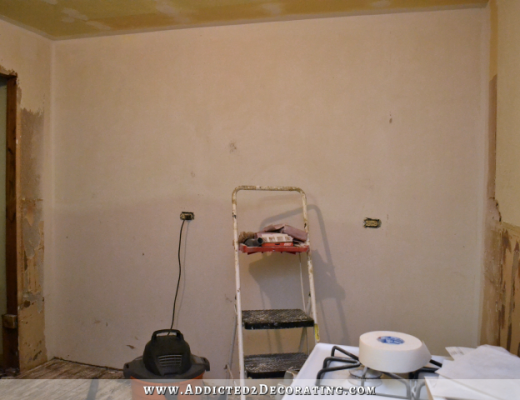 I want to see the breakfast room finished too but, it is Kristi’s site (I call it Kristiland) and when in Rome ….. I am sorry Kristi, I meant no disrespectful. I have campaign mania. I can relate with election mania. 🙂 I think the entire country is suffering from it. I’ve been so on edge and bitchy for the last two days…poor Matt for having to deal with me. I’m ready to exhale, shake off the last few months, and get on with life. And who gets a redo on renovations? I do. As many times as I want. It’s my house, my money, and my time, and I shouldn’t have to (continue to) justify what I do with any of those three things. But for people who don’t have the time and/or the money to do that, well, then my blog is perfect for them. Not only do I pass along useful low-cost ideas like the very ones in this post, but all of my trial and error that I spend my own money on could probably save others thousands of dollars. You’re welcome. And may I just add that for those of us who hire out the work, Kristi can save us from going down the wrong path with more of our money . He might even have a very easy solution to stripping of your old sealer. Never hurts to ask. Interesting products. I have epoxy over cement floors throughout my house. It’s likely an older product as it was done 15 or more years ago. 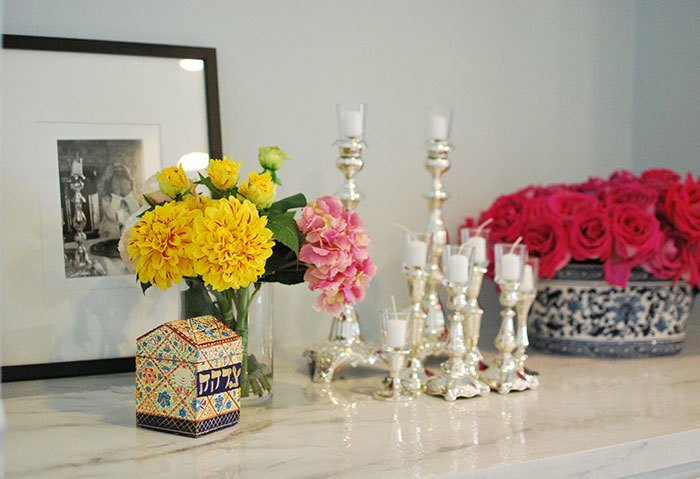 It still looks beautiful in most areas but if something heavy is dropped on it, the surface can chip so I have some little dings on the kitchen floor and a bigger chip, right down to the cement, where my cats knocked a very heavy vase on to the floor. Poor vase. Poor floor! The fellow who installed my floors told me it would be difficult to match and patch the damaged area. Hopefully the new products don’t have this issue but do ask about it. Kristi you are a encyclopedia of useful info. I’ve not heard of polyurea…sounds fantastic. I can’t wait to see the finished countertops. I read the link re: your Grandmother. What an amazing woman, you come from good genetic stock. Another cautionary tale; a friend was cooking with gas, leaned over to adjust a pot on the rear burner, her polyester “shell” caught fire. Her husband had the presence of mind to throw her in the shower. She had “spider web” burns over most of her torso. This is another reason to WEAR AN APRON when cooking. A good old-fashioned 100% cotton or linen apron. Wow! Awesome post! You educate us all and we thank you! so exciting!!! I can’t wait to see the finished product! I hope you plan to do a sample first with the polyurea over your faux marble. My fear is that it wouldn’t look like marble once it has polyurea on top but would look like a faux finish with a clear coating over it: In other words it would look like what it is. Would that bother you? If it would, then this might not be the solution you’re seeking. How wonderful to have such a grandmother! I loved seeing a woman who still looked elegant at 99. Don’t know why I did not think of that for you, as we had our garage floor done with it. The floor was such a skanky mess after twenty five years of workshop living, that it was the one solution that we thought might not have buyers running away when they saw the garage. Now we can sweep the floor and keep it clean. Nice enough for a party. Of course we did not do it, a paint contractor did. Good luck I think this is a great idea for your kitchen, especially since you can work small areas at a time. The choices both sound promising and I’m sure that whichever one you choose will look fabulous! I work with a woman who owns a small apartment building and she used the epoxy to refinish the countertops in the kitchen and bathrooms and it came out amazing! 2 years later and 2 different tenants they are still in great shape. She said she used the Rustoleum brand. I think I would of returned those stripping products as they didn’t do what they said they would. Hope your back is healing, but it gave you a chance to do the research and find a better choice. Weird the dog vitamins penetrated the sealer but not the stripper. Just to be safe in the future maybe keep one of the glass cutting board on the counter for the dog vitamins. Would hate for it to stain the new one. Waiting to see where you are at. Did the counter guy come yet? He still hasn’t been here. 🙁 I was hoping to hear from him today, but still haven’t. That’s got to be disappointing. Hope he gets in touch with you.